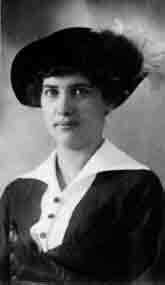 Gifted writer-editor Isabelle Florence Story (1887-1970) entered federal employment in 1910 with the U.S. Patent Office. The following year she transferred to the U.S. Geological Survey and from there came to the National Park Service in 1916. In 1917 Horace Albright, who was serving as acting NPS director during Stephen Mather’s illness, called on Story to be his secretary. At age 28, her business college education and writing experience had prepared her to be much more than a secretary in the Interior Department. As Albright’s workload increased, she began to play an increasingly important role in many of the agency’s day-to-day operations. Most notably, Story collaborated with Albright on compiling the agency’s annual reports for 1917, 1918, and 1919. Along with these responsibilities, she wrote press releases and articles promoting the national parks and monuments and developed other publications that would be distributed to park visitors. During her extensive travels throughout the national park system in the 1920s she accumulated invaluable firsthand knowledge of the people and places of the NPS that not only helped her in her writing but also helped her as she took on responsibility for editing its publications. When she became editor-in-chief for the NPS, one of her major responsibilities was editing the information publications distributed to national park visitors. She assumed her growing responsibilities and new assignments with energy and grace. In the 1940s, with the expansion of the national park system early in the administration of Franklin D. Roosevelt, the size and scope of the NPS publications program grew dramatically and the agency added 50 employees to her staff. Her office also produced radio scripts, and Story is credited as one of the first advocates of a national parks magazine. With U.S. involvement in World War II, the size of her staff and the publications program would be dramatically reduced. When NPS Director Newton Drury decided in 1946 to establish a Division of Information (later the Branch of Information) Story became assistant chief of Information, but she never relinquished the title editor-in-chief. She continued in that capacity until her retirement in 1954. Her accomplishments as a writer include preparation of a revised edition of the famous Yellowstone book written by General Hiram Chittenden and a revision of the National Parks Portfolio. Toward the end of her career, she also prepared The National Park Story in Pictures. She was a woman of remarkable achievement standing alongside Albright and the other giants in the agency’s early years. Her independent spirit and her writing and editing skills made her invaluable to an agency struggling to establish its identity during those early years.